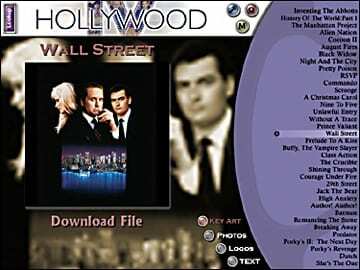 Fox’s Movie Division in Hollywood, CA selected LionSky Media to create an interactive, cross-platform media CD-ROM for it’s most popular movies in the archives for selection and promotion to Movie distribution houses and affiliate television stations. The hybrid CD-ROM included hi-resolution logos, preview video clips, promotional photography and text copy for detailed and overview descriptions. LionSky performed the preparation of the raw source materials to make them compact and useable by the creative departments that would work with the associated media elements. Videos were digitized and edited with state-of-the-art technologies at the time. Hi-resolution drum scans were included of key artwork and promotional photos. Lower resolution preview images were created to make the previewing and browsing experience fast and friendly. All of the high-resolution or memory intensive elements were contained on the CD in a compressed format and was only accessible on an as needed basis. The creation of the CD was a vast improvement over the traditional distribution processes at the time. The world wide web did not offer the high-band width and was not very secure. The movie studio would have to process individual requests one at a time and then ship the materials around the country. The cost-savings and compact data storage, enable the studio to repeat this process for several years providing savings well over $100,000 per year. As the technology on the web evolved, LionSky moved the system to the internet and phased down the CD distribution process. The CDs were still distributed to some affiliate stations that did not have high-bandwidth access or preferred not to wait for downloads and slower web browsing speeds. 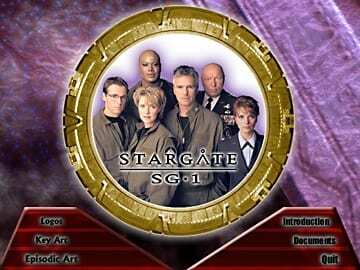 Other CD-ROM projects included CDs for Stargate, ABC Television, 3rd Rock form the Sun, Jeopardy, Wheel of Fortune, Martha Stewart Living, Profiler and Hollywood Squares. Various software was used for the development on the project; Adobe PhotoShop & Illustrator, Macromedia Director & various 3rd Party Plug-Ins, Microsoft Word & Excel, SoundEdit Studio, Debablizer Pro, Media Cleaner and After Effects.